Yesterday, the official NBA 2K facebook account posted an announcement that the NBA All Star uniforms are now available in NBA 2K17. Now players can pick these uniforms and have opportunity to use the hashtag #NBAVote feature casting their vote for their most like players. 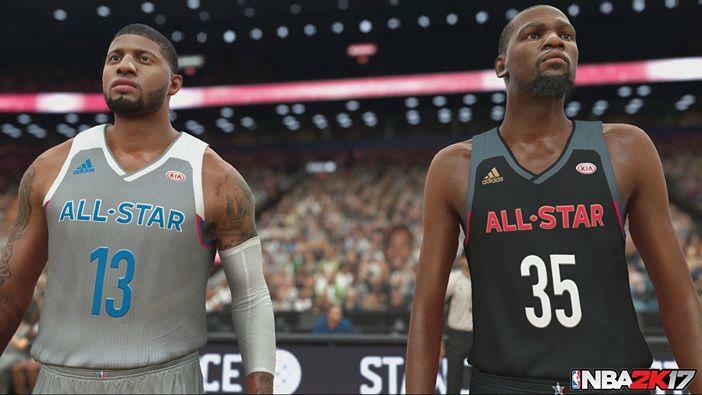 Actually, the NBA All-Star uniforms have been previously leaked in NBA 2K17 when the game released in September, but the jerseys officially revealed today and are available now in-game. Here're the announcement details: "The NBA All-Star jerseys were announced and now they're in NBA 2K17! Pick them up and remember to vote for your favourite player using #NBAVote!" Various All Star team jerseys have been put in each of the other NBA 2K games in the past few years, along with the various courts that the All Star game is played on. The NBA All Star game is an exhibition game used in the American National Basketball Association, and is a game where the Western Conference of the NBA and the Eastern Conference of the NBA pit their star players against one another on two teams to see which one is better. These courts and jerseys start from the 1991 All Star jerseys and game in the Charlotte Coliseum while the 2017 NBA All-Star game will be held in New Orleans, Louisiana on Feb. 17. It should be noted that the NBA 2K17 All-Star tournament is open for participation for gamers from the United States and Canada only. The NBA All Star uniforms will be worn at the All Star game when it begins in New Orleans next month. And the Eastern All Stars wear light granite and blue-colored while the Western All Stars will be decked in charcoal black and red uniforms. By the way, the NBA 2K17 All-Star tournament also be launched by NBA 2K, and the tournament will pit Pro-Am teams, formed by various online players, against each other in a series of events. The triumphant team would not only receive tickets to the NBA All-Star Game at the Smoothie King Center in New Orleans but also win a grand prize package of $250,000. Hope 2K take their competitive gaming scene to the next level with All-Star Tournament.